($3 /each). I said sure send me pictures of them. So he does and a couple of them looked like they might be old pictures of Tacoma C&GC so I said sure, I'll buy'em. Then they show up in my mailbox and when I open up the package, one of them is just amazing and very, very old. 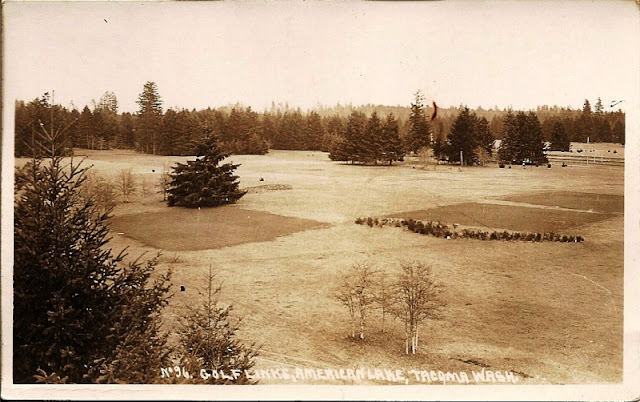 It say's "golf links, American Lake, Tacoma Wash." Here it is. So I'm studying this picture and saying to myself, if this is Tacoma C&GC, it must be a picture of the old 18th and 16th because that's the only place on the course where two greens are that close to each other. 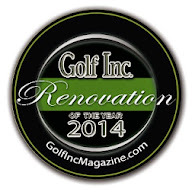 The only problem was the green on the far left would then be the old 9th and it is in the wrong spot. 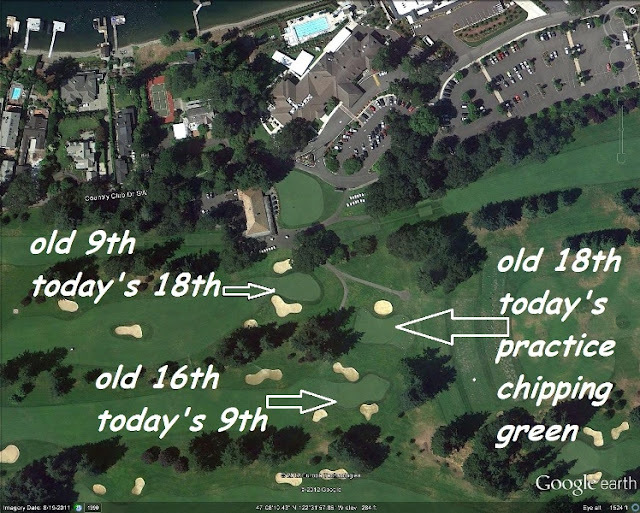 Here is the configuration of the area today after the course was rerouted in 1989. So there was now doubt in my head whether or not this was actually an old picture of Tacoma C&GC. I wanted to find out for sure so I dug out the oldest known map of the course which is the as-built for the installation of the wood stave pipe in 1923. What is wood stave pipe? The earliest of irrigation pipes and yes it is made of wood. Here is a picture of a piece that I unearthed on the course at Tacoma and keep in the maintenance shop as a conversation piece. Anyway, I dig out this old map and when I unroll it, I am thrilled to see that indeed the old 9th green used to be where it is in the picture and the old blueprint even depicts the greens as square like in the picture. 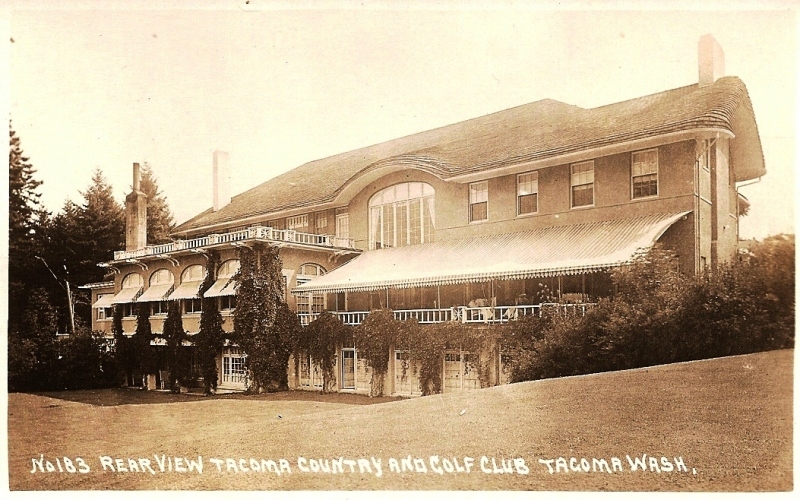 The old postcard is definitely a picture of Tacoma C&GC and one of the oldest known to date. Also, it is clear that the golf course was first a "link's" style golf course as I've always suspected since when this Club was founded, all there really was were link's style golf course. Here's the area on the 1923 map. You can imagine that I am just so excited at this point. Now this map is made in 1923 and clearly there was some kind of sprinkling system in front of the old 9th green at that time. In the old postcard picture it appears like that sprinkling system is not there yet so I would say this picture predates 1923. Also, the Club's history book says that in 1922, they laid out fairways which we can see are depicted in the map but in the postcard picture it looks like fairways were not existing yet. So maybe this picture was taken in the teens. We might never know but Jim Barnes was head pro here from 1910-1915 so it's safe to say this is what the course looked like back when he won the PGA Championship and U.S. Open. Here's a picture of the map from the same angle that the old photo was taken. And here again is the postcard photo. You can see that this is clearly an old picture of Tacoma C&GC. O.K. so now here is a picture of the same area taken yesterday from almost the exact same angle.